DPZ, Domino’s increased the dividend by 18.18% making this dividend challenger’s 7th consecutive year dividend increase. The old dividend rate was 2.20 annual dividend payout (0.55 quarterly), the new rate is 2.60 (0.65 quarterly). Our current fair value of the company is $255.16 a share so at the current price of $248.57 the stock is undervalued. In order for this stock to be marked a “buy” our three conditions must be met for us to buy the stock. The current yield is 1.05%. The 10 year YOC would be 6.52% with no dividend reinvestment and 8.29% with DRIP. This is a great dividend growth but won’t be able to reach 10% YOC in 10 years, at least not at current yield. However, the average 5 year dividend growth rate of 22.50% makes this stock a great holding in a dividend growth portfolio. The company share price outperforms the S&P 500 index in long term. If you invested 10,000 dollars in 1995 and held for the last 14 years, the stock average total return would be 28.05% vs 8.74% of the index, and your holding would grow to a staggering $374,142.76 dollars as opposed to $32,949.48 dollars of the index. And since DPZ is also involved in technology, rather than just making great pizza, there is a great potential for more growth in the long run (just ignore what others say and all the gloom-doom scary cats say, they just see the stock until the next quarter and due to their short sight they miss the bigger picture). Therefore, the recent selling is a good opportunity. This make this stock a great source of income in the long run, but also provides a good source of growth for your portfolio. I consider this stock a good addition for dividend portfolio accumulation and growth phase. If you are looking for both – dividend yield, dividend growth, and capital appreciation outperforming the index, then this stock is for you. Disclosure: Currently, I do not own DPZ stock at this moment. It is in our watch list and since it is now ranked as “buy” we may initiate a position in this stock in the near future (given, it still stays ranked as BUY at the time of purchase). PPL increased the dividend by 0.61% making this dividend contender‘s 18th consecutive dividend increase. The old dividend rate was 1.64 annual dividend payout (0.41 quarterly), the new rate is 1.65 (0.4125 quarterly). Our current fair value of the company is $36.27 a share so at the current price of $31.93 the stock is undervalued.However, in order for this stock to be marked a “buy” our three conditions must be met for us to buy the stock. The current yield is 5.17%. The 10 year YOC would be 6.23% with no dividend reinvestment and 10.20% with DRIP. This small dividend growth makes this stock more of a lagging stock however, as a utility stock, it appears to be a stable stock and dividend payer. In my opinion it is an acceptable holding in a dividend growth portfolio. The company share price outperforms the S&P 500 index long term. If you invested 10,000 dollars in 1995 and held for 23 years, the stock average total return would be 10.83% vs 8.74% of the index. This make this stock an acceptable source of income but also provides a good source of growth making this a good stock for dividend portfolio accumulation and growth phase. If you are looking for both – dividend yield, dividend growth, and capital appreciation outperforming the index, then this stock is for you. Disclosure: Currently, I am long PPL and own shares of this company. It is in our watch list and when it appears as “buy” we may buy more shares of this stock. VLO increased the dividend by 5.88% making this dividend champion‘s 9th consecutive dividend increase. The old dividend rate was 3.20 annual dividend payout (0.8 quarterly), the new rate is 3.60 (0.9 quarterly). Our current fair value of the company is $81.97 a share so at the current price of $82.33 the stock is overvalued and in order for this stock to be marked a “buy” the three conditions must be met for us to buy the stock. The current yield is 4.37%. The 10 year YOC would be 71.89% with no dividend reinvestment and 360.44% with DRIP. This rapid growth is something which worries me a bit as I think it is too steep so be prepared to possibly see a decline in this growth. On the other side, I do not think this makes the dividend safety endangered. The company share price outperforms the S&P 500 index long term. If you invested 10,000 dollars in 1995 and held for 23 years, the stock average total return would be 16.37% vs 8.74% of the index. This make this stock a great source of income but also provide a great source of growth making this a good stock for dividend portfolio accumulation and growth phase. If you are looking for both – dividend yield, dividend growth, and capital appreciation outperforming the index, then this stock is for you. Disclosure: Currently, I am long VLO and own shares of this company. It is in our watch list and when it appears as “buy” we may buy more shares of this stock. MMM increased the dividend by 5.88% making this dividend champion‘s 61st consecutive dividend increase. The old dividend rate was 5.44 annual dividend payout (1.36 quarterly), the new rate is 5.76 (1.44 quarterly). Our current fair value of the company is $191.49 a share so at the current price of 206.57 the stock is overvalued and in order for this stock to be marked a “buy” the three conditions must be met for us to buy the stock. The current yield is 2.79%. The 10 year YOC would be 9.66% with no dividend reinvestment and 15.18% with DRIP. The company share price outperforms the S&P 500 index long term. If you invested 10,000 dollars in 1995 and held for 23 years, the stock average total return would be 11.64% vs 8.74% of the index. Disclosure: Currently, I am long MMM and own shares of this company. It is in our watch list and when it appears as “buy” we may buy more shares of this stock. KMB increased the dividend by 3.00% making this dividend champion‘s 47th consecutive dividend increase. The old dividend rate was 4.00 annual dividend payout (1.0 quarterly), the new rate is 4.12 (1.03 quarterly). Our current fair value of the company is $76.01 a share so at the current price of $116.00 the stock is overvalued and in order for this stock to be marked a “buy” the three conditions must be met for us to buy the stock. Since only one of the conditions are met, we mark it a “hold”. The current yield is 3.55%. The 10 year YOC would be 5.28% with no dividend reinvestment and 7.68% with DRIP. The company share price tracks the S&P 500 index long term. If you invested 10,000 dollars in 1995 and held for 23 years, the stock average total return would be 8.99% vs 8.74% of the index. This make this stock a good source of income but also provide a good source of growth making this a good stock for dividend portfolio accumulation and growth phase. If you are looking for both – dividend yield, dividend growth, and capital appreciation outperforming the index, then this stock is for you. Disclosure: Currently, I long KMB and own shares of this company. It is in our watch list and when it appears as “buy” we may buy more shares of this stock. CVX increased the dividend by 6.25% making this dividend champion‘s 32nd consecutive dividend increase. The old dividend rate was 4.48 annual dividend payout (1.12 quarterly), the new rate is 4.76 (1.19 quarterly). Our current fair value of the company is $295.01 a share so at the current price of $118.72 the stock is undervalued but in order for this stock to be marked a “buy” the three conditions must be met for us to buy the stock. The current yield is 4.01%%. The 10 year YOC would be 4.88% with no dividend reinvestment and 7.17% with DRIP. The company share price outperforms the S&P 500 index long term. If you invested 10,000 dollars in 1995 and held for 23 years, the stock average total return would be 10.59% vs 8.74% of the index. This make this stock a good source of income but also provide a great source of growth making this a good stock for dividend portfolio accumulation and growth phase. If you are looking for both – dividend yield, dividend growth, and capital appreciation outperforming the index, then this stock is for you. Disclosure: Currently, I long CVX and own shares of this company. It is in our watch list and when it appears as “buy” we may buy more shares of this stock. ADM increased the dividend by 4.48% making this dividend champion‘s 44th consecutive dividend increase. The old dividend rate was 1.34 annual dividend payout (0.335 quarterly), the new rate is 1.40 (0.35 quarterly). Our current fair value of the company is $28.22 a share so at the current price of $42.44 the stock is overvalued and we mark it a “hold”. The current yield is 3.16%. The 10 year YOC would be 8.35% with no dividend reinvestment and 13.01% with DRIP. The company share price tracks the S&P 500 but is not able to outperform the index. If you invested 10,000 dollars in 1995 and held for 23 years, the stock average total return would be 7.63% vs 8.74% of the index. This make this stock a good source of income but with under performing growth. If you are looking for both – dividend yield, dividend growth, and capital appreciation outperforming the index, then this stock is not for you. Disclosure: Currently, I do not own ADM, but it is in our watch list and if it appears as “buy” we may buy shares of this stock. 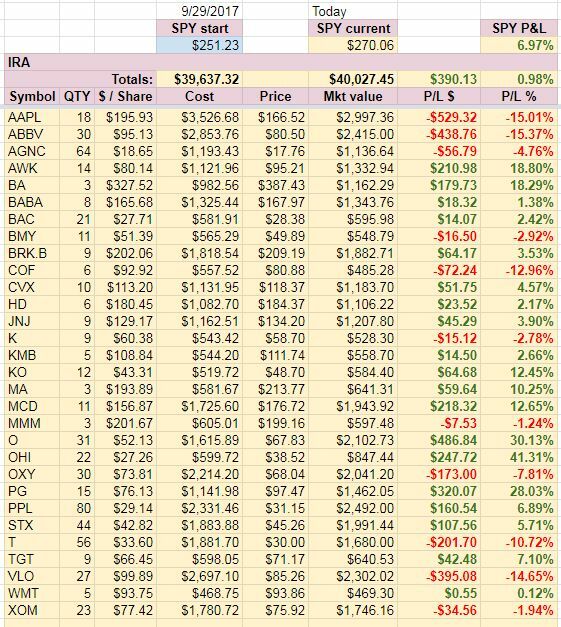 We closed our books last week revealing that we made over $2,600 in January (after quite slow start) which allowed us to invest some of the proceeds into good dividend growth stocks. We use 50% of the options trading proceeds to buy DGI stocks according to our watch list. Whenever a stock is marked as a buy and we have generated enough income, we buy shares equivalent to $600 dollar investment. 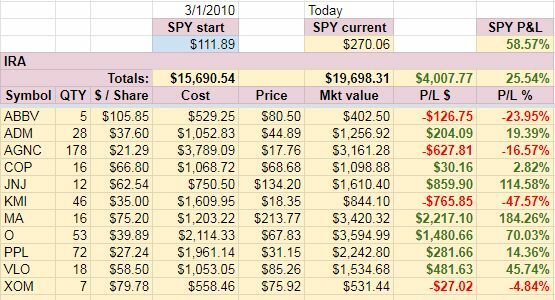 If we have more than $600, for example $1,300 dollars, we then buy (2) different companies (for example ATT and STX as we did in January 2019). If in our watch list, there are multiple shares marked as “buy” we buy the one with the highest dividend yield. Once a stock is purchased, it is marked with “X” so we do not buy it again once we make new money trading options. Then we continue buying all stocks in the list marked as “buy”. After all marked stocks are purchased, all “X”es are removed and we start from the beginning. I just finished reporting December 2018 and we are again at the end of another month. True, I reported December late. January started off slow, but ended up well. Our accounts are up and recovering from last year slaughter. But the question is, are we out of the forest or is more carnage coming? Boy, I wish I knew. In January, we continued trading successfully in our IRA account and made nice income of $2,661.00 in received premiums. In our other accounts, TDA and ROTH, we didn’t trade this month. We only managed opened trades to roll what was necessary to do. January started very slow and at first, it looked like we will not be able to purchase any shares this month as we didn’t meet cash flow criteria to purchase new shares. However, two weeks before month end our income jumped up and it allowed us to buy a few shares to add to our dividend income portfolio. It wasn’t easy to choose which stock to buy as many great sotcks in our watch list were indicated as “buy”. We decided to add STX in the end. At the very last week of the month, our income increased enough to allow us more purchases next week. We haven’t purchased any shares in ROTH or TD this month. · What’s next in the stock market? I am unsure what to expect from the market in upcoming month. January 2019 was definitely one of the best months since 3 years ago. We went up +8%, almost 9%. We went up however, too much and too fast. I wish this rally / recovery continues but, when reviewing historical charts, it could actually be bad for the market if we do not see any pullback or consolidation at the current levels. 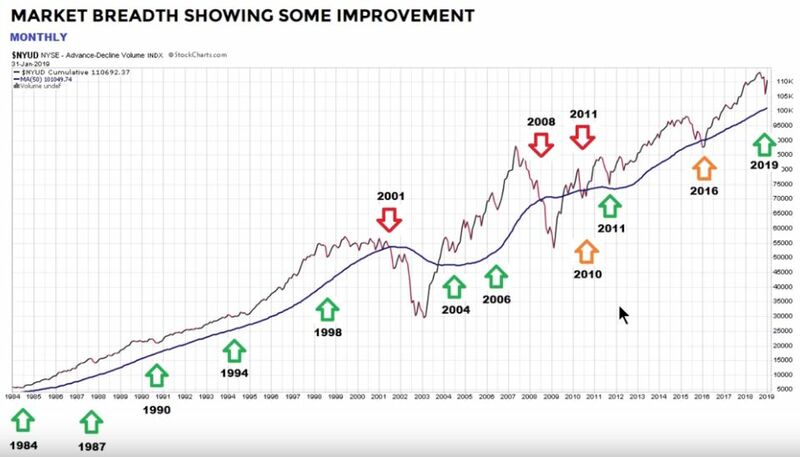 Many bearish charts from the past since 1955 indicated bad things happening in similar situation when the market hasn’t pulled back. Thus the market is giving us mixed signals. I can’t say where we are heading from now.